Charlie Brooker is the creator of the anthology series Black Mirror. Charlie Brooker has worked as a writer, journalist, cartoonist and television and radio presenter. 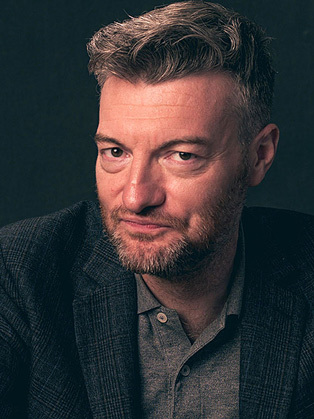 Charlie Brooker's recent television presenting credits include Charlie Brooker's Screenwipe, a BBC Four TV review show that Charlie writes and produces and won a Royal Television Society award. The BAFTA-nominated Newswipe with Charlie Brooker is a critically-acclaimed spin-off series which exposes the inner workings of news media and the way the news is presented to us. The series won Best Comedy Entertainment Programme at the 2010 British Comedy Awards. In 2012 Charlie won the British Comedy Entertainment Personality Award for his BBC2 show 2011 Wipe With Charlie Brooker. Charlie Brooker's Weekly Wipe is a new topical studio show starting early 2013 in which Charlie will review all what has been happening in the world of news, politics and culture. For Channel 4 Charlie co-hosts 10 O'Clock Live with David Mitchell, Jimmy Carr and Lauren Laverne. A third series is returning Spring 2013. Recent screenwriting credits include Black Mirror, a darkly comic anthology series for Channel 4 that tapped into the collective unease about the modern world. The drama won the Rose D'Or and an International Emmy for Best TV Mini-series in 2012. The second series is scheduled for early 2013. Also in 2012 Charlie wrote and was showrunner on A Touch of Cloth, a crime detective spoof starring John Hannah and Suranne Jones, for Sky One. Two new films are scheduled to air Spring and Summer 2013. Other TV writing credits include: Dead Set, a BAFTA-nominated satirical horror drama for Channel 4; The 11 O'Clock Show and the Brass Eye Paedophilia Special. Charlie also created TVGoHome, the hugely successful satirical website, which was turned into a book by Fourth Estate and a sketch show for Channel 4. Also borne out of the website was the Channel 4 cult comedy drama, Nathan Barley, that Charlie co-wrote with Chris Morris. Other hosting credits include Channel 4's You Have Been Watching, a comedy quiz about television, which won him Best Newcomer at the British Comedy Awards in 2009 and So Wrong It's Right, a comedy panel show for Radio 4 - a fourth series is scheduled for 2013. Charlie is also well-known for his weekly column in The Guardian and won The Press Awards' Columnist of the Year in 2009.